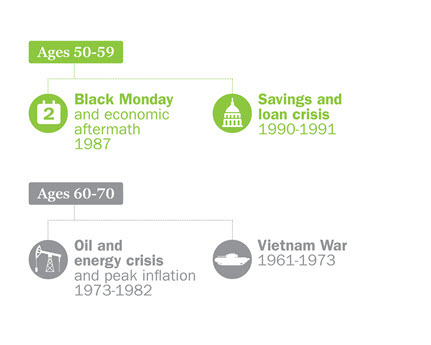 Financial life stages: How do you compare? It’s common for Americans of every age group to experience a significant financial setback. The causes and effects of each age group’s most common setback are different depending on cultural shifts and global events. Those who take action to respond to setbacks overwhelmingly report they’ve overcome their financial obstacles. According to the new Ameriprise Ages, Stages & Money study, 9 out of 10 investors with at least $100,000 in investable assets report feeling confident about their financial future. You may be wondering how Americans can stay so optimistic despite global turmoil, tepid wage growth and a divided political climate. It seems that study respondents remain positive about their financial progress in spite of upheavals along the way: 8 in 10 can list significant setbacks that have negatively impacted their financial journey. The study, which surveyed more than 3,000 Americans ages 30–79 with at least $100,000 in investable assets, reveals the top financial setback for younger respondents is a job loss or career issue. Market loss is the leading derailer older respondents cited. The good news is that 6 out of 10 respondents say they’ve fully recovered from these events. The upshot? Financial setbacks are inevitable — and recoverable — during every decade of life. Identifying major hurdles, knowing where you are in your financial life cycle and potential missteps to avoid can help you stay on track toward your goals. “Investors at various ages and stages of life who are taking action to manage their money feel financially confident despite the obstacles they’ve faced,” says Marcy Keckler, Vice President of Financial Advice Strategy at Ameriprise Financial. Discover how your own experiences stack up against your peers in the survey. Interestingly, age seems to be less of a factor in where people identify themselves in their financial journey. 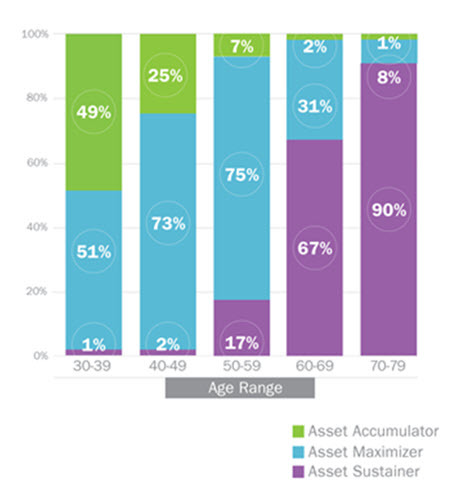 The study defined three life stages: Asset Accumulator, Asset Maximizer and Asset Sustainer. Conventional wisdom aside, Accumulators weren’t all in their 30s and Sustainers weren’t all retired. There was statistically significant age variance among the life stages. How do you compare with others your age? Read on to see which life stage best describes you. while balancing asset accumulation with managing debt. and you have accumulated some assets and are focusing on growing assets in retirement accounts and achieving other long-term goals. and your priorities include determining drawdown strategies and adjusting investments to make your money last. Which life stage do you identify most with? Select Asset Accumulator, Asset Maximizer or Asset Sustainer, and see how you compare to others we’ve surveyed. 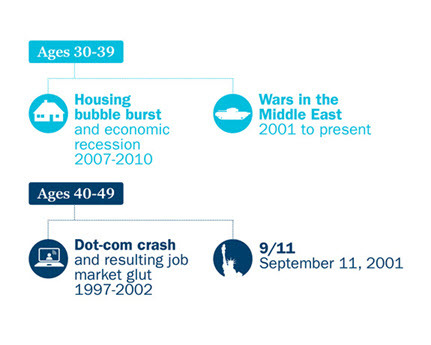 of people in their 30s identify with this life stage, plus 10% of respondents over 50 according to our survey. of people in their 50s identify with this life stage, plus 73% of people in their 40s and 31% of people in their 60s according to our survey. of people in their 70s identify with this life stage, plus 67% of people in their 60s and 17% of people in their 50s according to our survey. Regardless of age, certain decisions have the potential to hinder investors’ financial futures. The most significant missteps reported were dipping into retirement plans and not protecting assets (i.e. not having long-term disability income or long-term care insurance). Despite these hiccups along the way, most respondents have recovered from mistakes. With time, the savings gap between what each life stage thinks they’ll need to retire and the actual amount they have decreases: from a $1.3 million gap among Accumulators to an $875,000 gap among Maximizers. No matter which financial life stage you're in, the study shows that it’s never too late to make course corrections or undo missteps along the way. Case in point: Many of the retirees who are currently investing in an employer-sponsored retirement plan reported that they started investing in it later in life. The Ages, Stages & Money study was created by Ameriprise Financial, Inc. and conducted online by Artemis Strategy Group December 8-21, 2017 among 3,019 U.S. adults between the ages of 30-79 with at least $100,000 in investable assets. For further information and details about the study, including verification of data that may not be published as part of this report, please contact Ameriprise Financial.